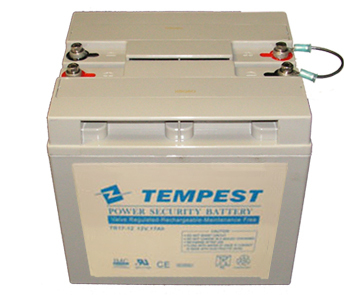 You may use the TR22-24 or the battery listed below for the same application. The Big Amp" 24 Volt, 22 Ah SLA BATTERY for use in Scooters, Electric Wheelchairs, and UPS Systems and general purposes. Length 7.13", Width 6.06", Height 6.57" (Total Height 6.57"), F12 terminals (Terminal hardware included), Approx Weight 28 lbs.